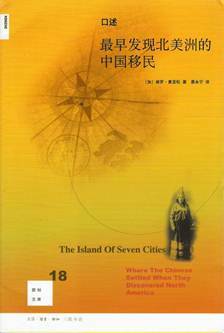 Has The Island of Seven Cities been translated into Chinese? Could the ruined stone platforms found on the Town Site, the open rectangular site at the summit of Cape Dauphin, be modern constructions built in 1989 by the gravel company that worked on cape as platforms they built for test drills? Could this road leading up the east side of Cape Dauphin to the ruins on the summit be a modern road and not, as the book suggests, an ancient construction with manmade stone walls lining its sides? Could the enclosure shown on this 1953 aerial photograph of the summit of Cape Dauphin be a fire break built in 1952 by a volunteer fire brigade as a way of containing a forest fire and not, as suggested in the book, the remains of town wall? The book was published in China in 2009 by SDX Joint Publishing Company, one of the leading publishing companies in the country. The front cover of the Chinese edition. The author’s Chinese name, given to him by the publishing company, evolved from the French pronunciation of his last name, Chiasson.. The pronunciation translates into Pinyin, or Mandarin written in Romanized characters, as Xia Yay Song. When spoken quickly (the final “g” is silent) it sounds like Chiasson. This Chinese name translates back into English as “Summer Second Pine Tree”. The author’s family name, Xia, or Summer, is a common surname in China. The author’s given name, Yay Song, or Second Pine Tree, not only sounds like the last two syllables of his Western surname, it also indicates that he is a second son. In the days before single child laws in China, many parents would give this name to their second son in hopes of him growing tough and strong like a towering pine.